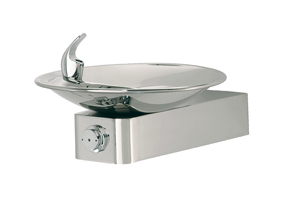 Model 1001HPS - Stainless Steel Drinking Fountain with Round Sculpted Bowl. The 1001HPS & 1001HPSBP barrier-free drinking fountain uses a patented stainless steel push-button valve assembly (Pat.# 6,981,692) allowing for front access stream adjustment as well as cartridge and strainer access. Wall mounted swirl bowl design with a high-polished stainless steel finish allows the 1001HPS & 1001HPSBP to be placed securely in multiple locations without taking up excess space. Equipped with vandal resistant components, this fountain is not easily disrupted, quickly discouraging vandals. Model 1001HPS Series is a Barrier-Free (Universal Access), Stainless Steel Drinking Fountain with Round Sculpted Bowl. 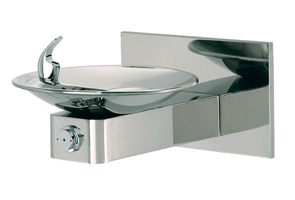 18 gauge Type 304 Stainless Steel High Polish Finish Basin with Integral Swirl Design. Model BP6HPS - Stainless Steel Back Panel.